The National Association of Public Hospitals and Health Systems has named Bruce Siegel as CEO, a newly created position for the organization that represents the nation's largest metropolitan hospitals and health systems that provide care to low-income individuals. 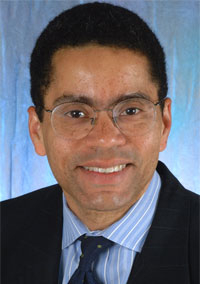 Siegel currently serves as the director of the Center for Health Care Quality and as professor of health policy at the George Washington University School of Public Health and Health Services. He will start at the association in October. According to an announcement from the association, Siegel, 49, is the first African-American to lead a major hospital association. The CEO position is replacing the executive director post, previously held by Christine Capito Burch, who is retiring. Previously, Siegel served as president of Tampa General Healthcare and the New York City Health and Hospitals Corp., both of which are members of the NAPH. He also served as health commissioner for the state of New Jersey and has led projects for the Commonwealth Fund, the California Endowment and the Agency for Healthcare Research and Quality.